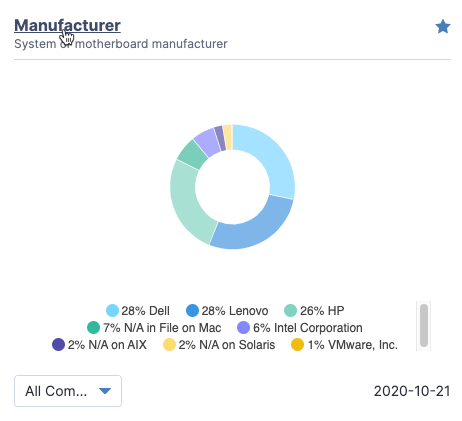 When you view a board, you can click a panel to view the data in more detail. Click the title of the board that you want to open. Click the title of the panel that you want to view. From the Trends View tab, you can temporarily modify the following settings. When you leave the page, settings are not saved. Chart Type Select the type of data visualization to use in the panel. For more information, see Reference: Chart options in Trends. Computer Group For a saved question source, select the computer group to display data from in the panel. The available computer groups include the computer groups visible to Trends that you have access to. Select a date or date range to display in the chart. For available options by chart type, see Reference: Chart options in Trends. Items Select specific items to include or exclude in the chart. The available items depend on the results that the source collects. To permanently modify panel settings, click Edit. From the Edit Panel dialog, you can change any settings for the panel. For a list of settings, see Add panels to the board. You can view the most recent data collected for panels that use saved question sources. To view live results for a saved question source, you must have read sensor privileges on the content set that contains the sensor used by the saved question source. For more information, see the Trends requirements. The Trends saved question displays along with the most recent results. Trends stores aggregate results of questions for computer groups visible to Trends. Trends does not store the full question results over the course of collection. You cannot drill down to past point-in-time data on specific endpoints, although it is possible to drill down on the current data set. For example, you cannot use Trends to see what OS patch a specific computer was running on a specific date in the past. 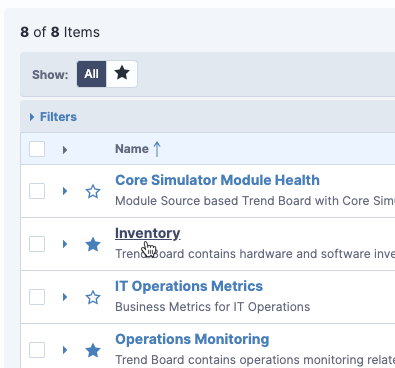 Instead, you can use Trends to view the most recent results about OS patches, and from recent results, you can drill down to results for specific computers. Select one or more rows and click Drill Down to obtain more details about the matching results. 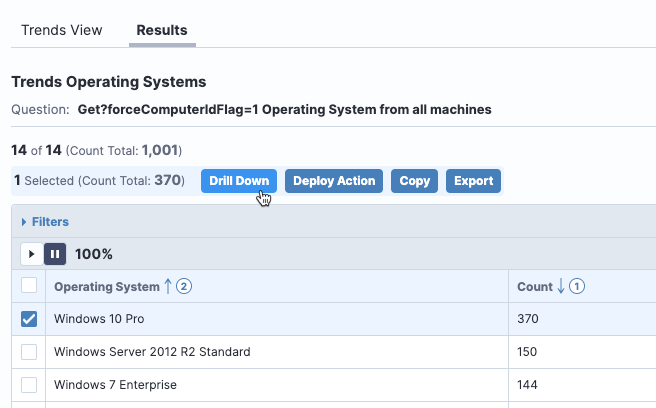 Select one or more rows and click Deploy Action to deploy appropriate actions to the selected endpoints. 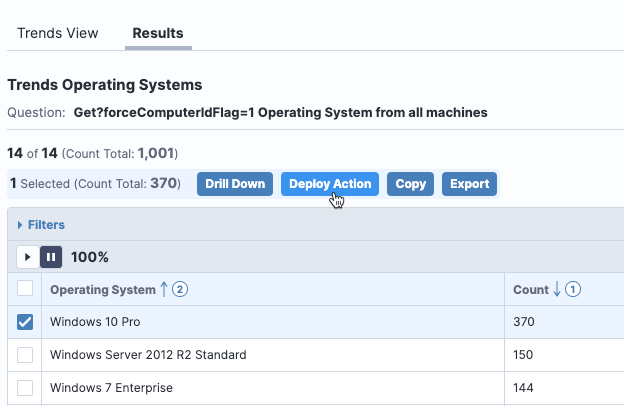 Click Go to Interact to open the saved question in Interact where you can view additional question details, ask additional questions, and deploy corrective action to endpoints.